As Netanyahu Brags of Killing Iran Deal, Where’s The Outcry? President Trump has made his most bellicose statement about Iran yet, and where else but on Twitter. Trump, warning Iranian President Hassan Rouhani that Iran, quote, will suffer consequences the likes of which few throughout history have ever suffered before. Trump claimed he was responding to a threat from a speech by Rouhani. But in fact, Rouhani had told Trump in his speech not to threaten Iran, and saying, quote: America should know that peace with Iran is the mother of all peace, and war with Iran is the mother of all wars. This comes as the U.S. ramps up efforts to destabilize Iran. In a speech on Sunday, Secretary of State Mike Pompeo outlined the campaign. MIKE POMPEO: Right now, the United States is undertaking a diplomatic and financial pressure campaign to cut off the funds that the regime uses to enrich itself and support death and destruction. At the center of this campaign is the imposition of sanctions on Iran’s banking and energy sectors. As we’ve explained over the last few weeks, our focus is to work with countries importing Iranian crude oil to get imports as close to zero as possible by November 4. AARON MATE: Joining me is Trita Parsi, president of the National Iranian American Council, and author of the book Losing an Enemy: Obama, Iran, and the Triumph of Diplomacy. Welcome, Trita. About a year ago around this time we were talking about Trump making these kinds of threats to North Korea. Now he is pivoting to Iran. Your make of what he’s saying here and his Twitter comment, and also these comments from Pompeo about ramping up its campaign of destabilization in Iran. TRITA PARSI: Yes, so I think it’s quite clear at this point that the Trump administration’s policy is one of confrontation. If there was any doubt before, I think that doubt has been removed. And Pompeo made it quite clear that they’re going for massive economic pressure on Iran. Other U.S. officials told Reuters over the weekend that the aim is to foment unrest in Iran, which means that they want to meddle in Iran and destabilize the country. And then immediately after Pompeo’s speech, as if it wasn’t hawkish enough, you had Donald Trump come out and essentially threaten nuclear war over Twitter. So at this point I think it’s, it’s quite clear. One has to have a tremendous amount of optimism if one thinks that the Trump administration is actually doing anything but seeking confrontation. AARON MATE: Let me go to more of what Pompeo said in his remarks. He likened the Iranian government to a mafia. MIKE POMPEO: The Ayatollah Khamenei has his own personal off-the-books hedge fund called the Setad, worth $95 billion, with a B, dollars. That wealth is untaxed. It is ill-gotten and it is used as a slush fund for the IRGC. The Ayatollah fills his coffers by diverting whatever he wants. This list goes on, but we’ve got places to go tonight. The level of corruption and wealth among leaders shows that Iran is run by something that resembles the mafia more than a government. AARON MATE: Trita, is that a fair characterization? You think of the Iranian government, and do you think it will resonate with the Iranian people? TRITA PARSI: There are certainly elements of the Iranian government that have been likened to the mafia before, and I think there is a degree of accuracy in that. And in fact, much of the criticism against the repression of the Iranian government, and particularly its corruption, are things that a lot of Iranian Americans and Iranians would agree with. But here’s the thing. It requires a major leap of faith to go from the frustration that people have, understandable and legitimate frustrations that they have with the government of Iran, and to then think that Donald Trump, John Bolton, and Mike Pompeo are the answers to Iran’s problems. It’s a leap of faith of a size I think makes it next to impossible for most people to take it, because just as much as the Iranian government is repressive and its economic policies have been disastrous does not mean in any way, shape, or form that Donald Trump, who is currently undermining democracy in Iran, is in a position to bring about more democracy- and undermining democracy in the United States- is in a position to bring about more democracy in Iran. AARON MATE: I want to note to a certain irony here, which is that the approach that Trump and his defenders are advocating is one that’s already been tried and failed, which is that this thinking that the U.S. can destabilize Iran enough for the people to turn on its government. Just today, this is Ari Fleischer speaking on Fox News. Ari Fleischer, former spokesperson for President George W. Bush, White House press secretary. ARI FLEISCHER: Fascinating changes underway inside Iran. No one can predict where they’re going to go. But the more unstable we can help Iran to become, the better it is to actually secure peace if we can get rid of that theological regime one day, or if the Iranian people can get rid of it themselves. AARON MATE: So that’s Ari Fleischer speaking on Fox News. Trita, the irony I want to note here is that this approach was actually tried, not by a Republican administration, but by President Obama. 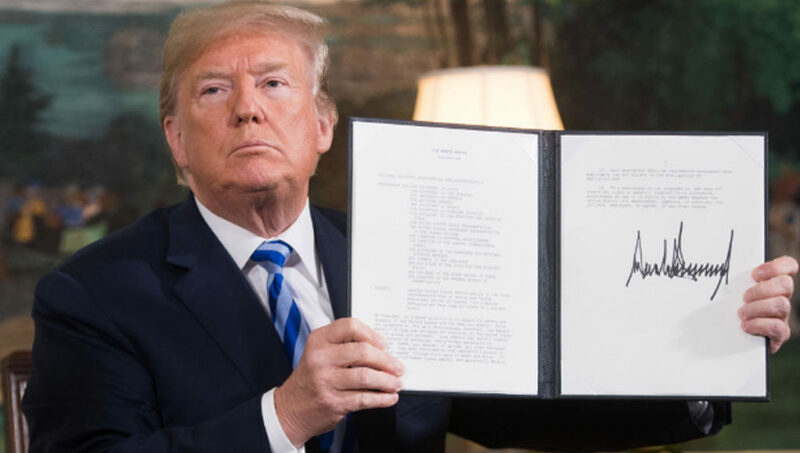 Your book Losing an Enemy documents how the Iran nuclear deal was born out of a realization on the part of Obama and his people that they could not squeeze and collapse Iran’s economy fast enough, so they made a deal with the regime as a result. So accordingly, why do you think it is, or how do you think it is the Trump administration will go about trying to squeeze Iran even more, and why do you think they believe it can succeed? TRITA PARSI: Well, because I think unlike Obama, who actually pursued that path because he wanted to get a deal, the Trump administration and people like Ari Fleischer, their objective is not to strike a deal at the end of the day. The objective is to simply cause instability in Iran. I think, mindful of how susceptible the Trump administration is to pressures from Saudi Arabia and Israel, if we put ourselves in the shoes of the Saudi government, for instance, do you think the Saudi government, that itself does not practice anything near democracy, would like to see democracy in Iran? I think that’s a preposterous thought. I think the Saudi government would fear democracy in Iran. Because if Iran actually had a fully democratic and confident and competent government, its power in the region would probably increase significantly, and shift the balance of power even further away from Saudi Arabia. What Saudi Arabia would like to see instead is actually instability in Iran. Destabilize the country, just as Ari Fleischer said. Because that actually would shift the balance of power in the favor of Saudi Arabia if Iran is using all of its resources to fight itself, essentially. And if you take a look at the map of the Middle East over the course of the last 20 years, one of the biggest differences is that today neither Iraq nor Syria are power players in the geopolitical games of the region any longer precisely because of the instability there, and the invasion of Iraq. And if you’re sitting in Saudi Arabia, that’s probably exactly what you wish for in Iran. AARON MATE: All right. We’ll wrap there and come back in part two. My guest is Trita Parsi, president of the National Iranian American Council.